Western Bits & Bobs - How Westerns Bits Work & More! Summer is now in full flow, and we are enjoying the warmer days and lighter evenings a lot! 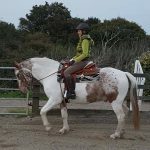 In this month’s blog, I will be introducing Toby to his first western bits, either a shank or curb bit, and how it feels as a rider to use this style of bit. I’ll also discuss the highs and the lows of horse ownership. Plus, in this months “Learn More”, we will look at Western Saddles, and how they are different to English saddles. Since we have been training in western riding, the biggest difference I have noticed with Toby is how much softer he has become in the mouth. He is currently ridden in a normal single jointed loose ring snaffle, that has a sweet iron mouth piece. This is probably the most basic snaffle I have ever had for him. With the help from my trainer, I have been able to retrain Toby in how to accept the bit, and not just lean on it, or use it to “rest” his head. Teaching him to lift and support his own body has made a huge improvement to his self-carriage. I also believe being more aware of my own body position has helped. I now sit more upright, and no longer hover over Toby’s shoulders, meaning I wouldn’t be adding to his already downhill conformation. In my last lesson my trainer bought a long a selection of shank, or curb bits to try on Toby. These bits can be somewhat controversial for many equestrians. Me being one of them before taking up western riding. But Western training and its principles are focused on how responsive your horse is with the cues you give them without ANY rein contact. The shank bit will act similarly to the Weymouth of a double bridle. It helps the horse to relax in the jaw and poll area, thus making them softer and suppler. I started off with warming Toby up. Walk, jog and lope a few times on each rein before coming into the middle for my trainer to swap headstalls (bridles). The shank bit we tried had a low port in the middle of the mouth piece and straight shanks. You can also get shanks which curve back slightly, these are normally called “grazers”. As with any new bit you’d try, I gave Toby some time to get use to the new mouth piece. When I use to ride English, we did compete a little in Showing, and he had already experienced a Double bridle, and accepted the Weymouth bit well. The first thing I noticed was how weightless my contact was. It was like holding a feather! I was a little nervous at first, so my instructor explained how to use my reins and what I should be feeling. He then showed me how to teach Toby to accept the new type of bit. The moment there was the slightest feeling of him leaning on the contact, I would bump my hands upwards, like I would with the snaffle bit, and as soon as I got the lightness back, and Toby was carrying himself, I would drop my hands and contact instantly. There would be no contact at all on the reins, and they would be long and drooping down. After a while walking round, we popped up into a jog, and practiced the same exercise. I would still be holding the reins as I would normally, one in each hand, and eventually, as we continue to build with our training, both reins would be held in one hand. Normally, when riding in Snaffles, you hold the reins one in each hand. When riding with shank bits however, both reins would be held in one hand. Towards the end of the lesson, we did some lope work with the new bit. The lift up into the lope was much more apparent. Toby was beginning to understand the new bit and holding himself more. The lope to whoa was much more precise also, with only needing to use a very slight contact and asking for whoa. My trainer was pleased with how this all went. We hope to try a few other mouth piece types, to make sure Toby is completely happy. As most horse owners know, no matter how much you plan, things can change in an instant. Having had such a great lesson, unfortunately things didn’t go as well just before our latest show. We were due to head off to our first showing show last month. We were super excited to finally get to wear our new Western showing outfit. It was a local Riding Club show, and they were allowing me to attend in Western attire. The week leading up to it, I had washed Toby all over, given his mane a trim and tidy and began prepping him. In western shows horse’s manes aren’t normally plaited. Instead they are either left natural, or if they are pulled, then “Banded”. This is when the mane is sectioned off as you would when plaiting. 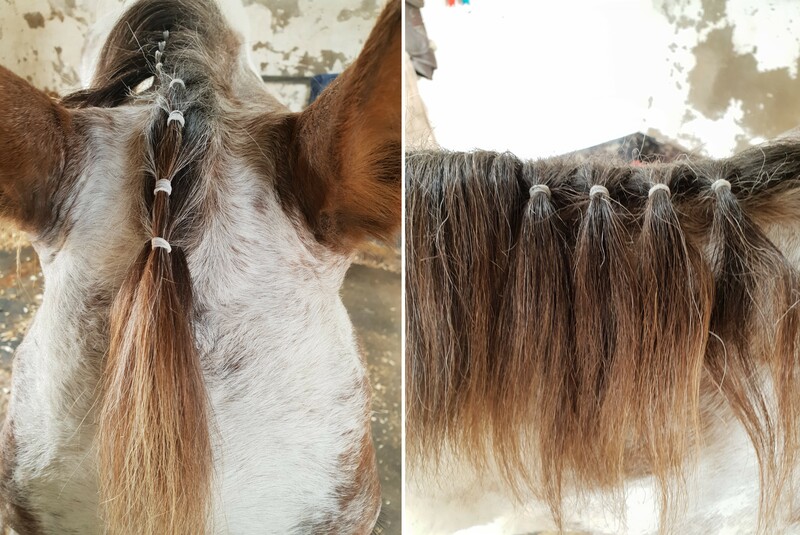 but instead of doing a plait, the section will just be banded like a mini ponytail, so it lays flat on the horse’s neck. Once the whole mane is done, you can use some scissors to make the mane look neat and straight. The forelock is also banded, but in sections, like when doing a traditional forelock plait, taking sections from each side and banding them together (see pictures). Tails are generally left natural. In some Western Shows extensions can be used to make the tail look fuller. Just as we were finishing off the prep work, I got a phone call… the show had been cancelled due to weather conditions! The rain had caused the show ground to become boggy and making it unusable. It was a great shame, as I was really looking forward to getting out, we hadn’t been out for over a year. Never mind though, there were always other days, and at least Toby was clean and trimmed! Unfortunately, this wasn’t the only unexpected bit of bad news we were to get. I went away for a week recently, meaning Toby had a week off work. A bit of time for him to chill out and enjoy himself. Once I got back, I spent the first day lunging & the second day out hacking. Just to ease back into work. He wasn’t 100%, a little stiff in places, but I thought that was just due to having a bit of time off. The next day when I walked him out he really wasn’t right and wasn’t happy. Very sore and footy, like he was walking on sharp stones. My first thought was laminitis. I contacted my farrier and vet and after a visit they both confirmed, it was indeed, laminitis. Plan of action is box rest for 2 weeks, no grass, limited hay (as he needs to lose a few pounds!) and pain relief if needed. Both the vet and farrier said if it wasn’t for me noticing the signs early on, it could have got worse, very quickly. Always trust your gut instinct! So, for now, whilst Toby is restricted to his stable, I will enjoy some quality time with him, and grooming. Hopefully it won’t be long before we are back in work! 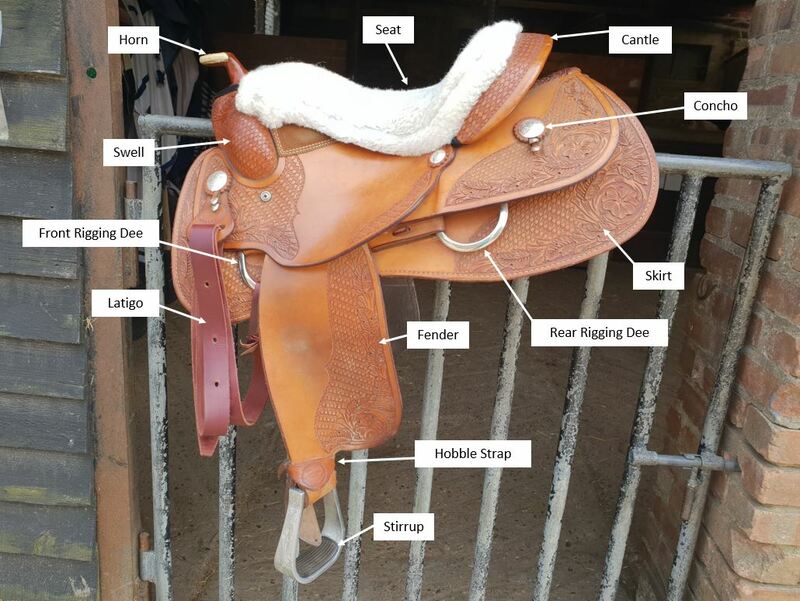 In this blog’s “learn more” section, we will look at the western saddle. The western saddle is a beautiful piece of artwork which is handmade, with intricate hand tooled leather. They spread the weight of the rider across a larger surface area of the horse’s back. This is due to the number of hours a rider could be in the saddle for when riding across acres and acres of land. As with English saddles, there are a variety of styles dependent on what discipline the horse/rider take part in. Western Pleasure for example is very much like showing, and so these saddles will be covered in tooling and silver and look stunning. Like English dressage saddles, they also tend to have deep seats and higher cantles to help the rider sit stiller. They can cost thousands of dollars, sometimes tens of thousands! (see picture). A lot of traditional American western saddles you see today will be very old, as they are built to last for many years, and they are tough and hard wearing.